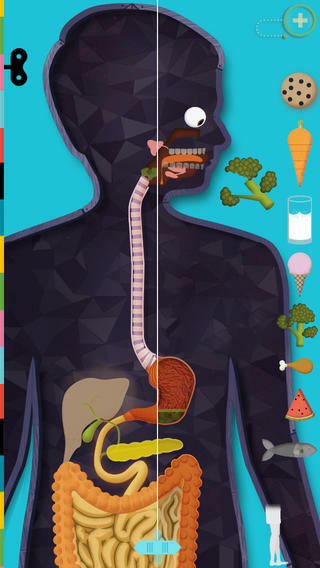 Only $.99 for a limited time – The Human Body, an educational app for kids 4+. This app from Tinybop is first in a series – designed for kids & adults to play, learn, and explore together. The app has a recording mode to encourage questioning, listening, and responding to each other. Basic human anatomy (skeletal, muscular, nervous, circulatory, respiratory, and digestive systems) are taught. The urogenital system is also available as an in-app purchase. Every body part is animated/ interactive for kids to explore – the heart beats, the lungs breathe, the eyes see, etc. The app uses the front camera to demonstrate vision, the microphone to show how hearing works, your photo/ music libraries to demonstrate brain function, and more. There is also a free online handbook (to guide you through the interactions & to provide you with facts) at Tinybop : Discover our apps with your kids. It is available in 8 languages but the text labels (within the app) can be switched to 50 different languages.